For those of you who have been involved in the Search Industry for some time now, you understand that the only constant in this industry is change. Technology and innovation continue to make the digital world better and ever-changing. The Search industry is an exciting one to be in, and even though there is a dominant player in Google, Search is transforming to include more than just search engines (although for this post. out focus is one that of search engines). One of the things we like to keep an eye on is how the value of Search Engine stock fluctuates with major industry announcements. Something that we have not discussed in some time is how the value of the search engines stack up from a share price perspective. 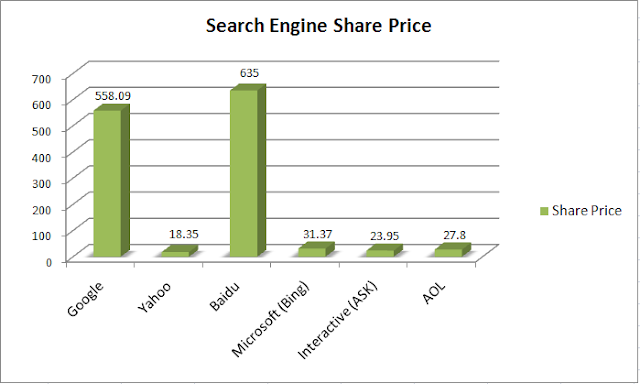 Of course one major announcement can have a dramatic impact on the share price, but we thought we would perform a comparison of some of the major search engines and/or their parent companies. Prices are as of 04-20-10, noon PST. IAC/InterActiveCorp (IACI) - parent company of ASK.com, IAC has more than 50 brands serving consumer audiences across more than 30 countries. Share price has increased by about 44% over the past twelve months. AOL (AOL) -AOl's share price has stayed pretty consistent with a 52 week range of $22.10-$28.65. As of today AOL share's price is $27.72.